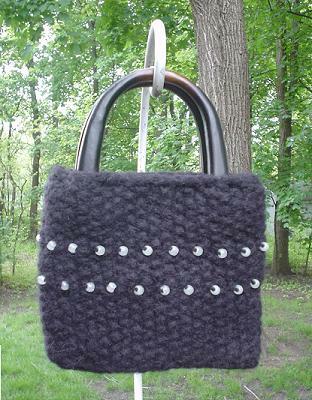 A black beaded purse. Created by the Daily Knitter staff. Thread beads on to 1 of 2 balls of yarn. Cast on 42 stitches working with 2 strands of yarn held together. (Purse will be worked with doubled yarn throughout) Join to work in the round, being careful not to twist stitches. Place marker on needle to indicate beginning of round. Round 14: P1, K1, repeat around placing 21 beads into each of the K stitches. Round 21: K1, P1, repeat around placing 21 beads into each of the K stitches. Cast on 19 stitches with yarn doubled. Turn (do not work in the round). Repeat row 1 6 times. Using the size J crochet hook, work 1 row of single crochet to connect the bottom to the body of the purse. Felt the purse using your preferred method. (Purse pictured is lightly felted to retain look of stitches.) Before letting the purse dry, pull out the beads from the matted fabric to the right side of the purse. Once dry, attach the handles.